Economize R$ 32,35 (31 %). Comprar eBook Kindle. Comece a ler Zero to One no seu Kindle em menos de um minuto. Peter Thiel is an entrepreneur and investor. He started PayPal in 1998, led it as CEO, and took it public in 2002, defining a new era of fast and secure online commerce. In 2004 he made the first outside investment in Facebook, where he serves as a director. The same year he launched Palantir Technologies, a software company that harnesses computers to empower human analysts in fields like national security and global finance. He has provided early funding for LinkedIn, Yelp, and dozens of successful technology startups, many run by former colleagues who have been dubbed the “PayPal Mafia.” He is a partner at Founders Fund, a Silicon Valley venture capital firm that has funded companies like SpaceX and Airbnb. He started the Thiel Fellowship, which ignited a national debate by encouraging young people to put learning before schooling, and he leads the Thiel Foundation, which works to advance technological progress and long- term thinking about the future. Blake Masters was a student at Stanford Law School in 2012 when his detailed notes on Peter’s class “Computer Science 183: Startup” became an internet sensation. He went on to co-found Judicata, a legal research technology startup. Every moment in business happens only once. The next Bill Gates will not build an operating system. The next Larry Page or Sergey Brin won’t make a search engine. And the next Mark Zuckerberg won’t create a social net-work. If you are copying these guys, you aren’t learning from them. Of course, it’s easier to copy a model than to make something new. Doing what we already know how to do takes the world from 1 to n, adding more of something familiar. But every time we create something new, we go from 0 to 1. The act of creation is singular, as is the moment of creation, and the result is something fresh and strange. Unless they invest in the difficult task of creating new things, American companies will fail in the future no matter how big their profits remain today. What happens when we’ve gained everything to be had from fine- tuning the old lines of business that we’ve inherited? Unlikely as it sounds, the answer threatens to be far worse than the crisis of 2008. Today’s “best practices” lead to dead ends; the best paths are new and untried. In a world of gigantic administrative bureaucracies both public and private, searching for a new path might seem like hoping for a miracle. Actually, if American business is going to succeed, we are going to need hundreds, or even thou­sands, of miracles. This would be depressing but for one cru­cial fact: humans are distinguished from other species by our ability to work miracles. We call these miracles technology. Technology is miraculous because it allows us to do more with less, ratcheting up our fundamental capabilities to a higher level. Other animals are instinctively driven to build things like dams or honeycombs, but we are the only ones that can invent new things and better ways of making them. Humans don’t decide what to build by making choices from some cosmic catalog of options given in advance; instead, by creating new technologies, we rewrite the plan of the world. These are the kind of elementary truths we teach to second graders, but they are easy to forget in a world where so much of what we do is repeat what has been done before. 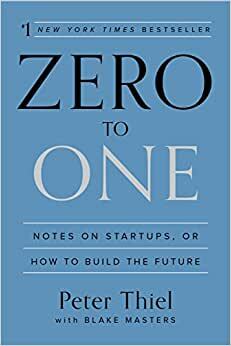 Zero to One is about how to build companies that cre­ate new things. It draws on everything I’ve learned directly as a co-founder of PayPal and Palantir and then an investor in hundreds of startups, including Facebook and SpaceX. But while I have noticed many patterns, and I relate them here, this book offers no formula for success. The paradox of teaching entrepreneurship is that such a formula necessarily cannot exist; because every innovation is new and unique, no authority can prescribe in concrete terms how to be innova­tive. Indeed, the single most powerful pattern I have noticed is that successful people find value in unexpected places, and they do this by thinking about business from first principles instead of formulas. This book stems from a course about startups that I taught at Stanford in 2012. College students can become extremely skilled at a few specialties, but many never learn what to do with those skills in the wider world. My primary goal in teaching the class was to help my students see beyond the tracks laid down by academic specialties to the broader future that is theirs to create. One of those students, Blake Masters, took detailed class notes, which circulated far be­yond the campus, and in Zero to One I have worked with him to revise the notes for a wider audience. There’s no reason why the future should happen only at Stanford, or in college, or in Silicon Valley. Whenever I interview someone for a job, I like to ask this question: "What important truth do very few people agree with you on?" This question sounds easy because it's straightforward. Actually, it's very hard to answer. It's intellectually difficult because the knowledge that everyone is taught in school is by definition agreed upon. And it's psychologically difficult because anyone trying to answer must say something she knows to be unpopular. Brilliant thinking is rare, but courage is in even shorter supply than genius. "Our educational system is broken and urgently needs to be fixed." Those are bad answers. The first and the second statements might be true, but many people already agree with them. The third statement simply takes one side in a familiar debate. A good answer takes the following form: "Most people believe in x, but the truth is the opposite of x." I'll give my own answer later in this chapter. What does this contrarian question have to do with the future? In the most minimal sense, the future is simply the set of all moments yet to come. But what makes the future distinctive and important isn't that it hasn't happened yet, but rather that it will be a time when the world looks different from today. In this sense, if nothing about our society changes for the next 100 years, then the future is over 100 years away. If things change radically in the next decade, then the future is nearly at hand. No one can predict the future exactly, but we know two things: it's going to be different, and it must be rooted in today's world. Most answers to the contrarian question are different ways of seeing the present; good answers are as close as we can come to looking into the future. When we think about the future, we hope for a future of progress. That progress can take one of two forms. Horizontal or extensive progress means copying things that work--going from 1 to n. Horizontal progress is easy to imagine because we already know what it looks like. Vertical or intensive progress means doing new things--going from 0 to 1. Vertical progress is harder to imagine because it requires doing something nobody else has ever done. If you take one typewriter and build 100, you have made horizontal progress. If you have a typewriter and build a word processor, you have made vertical progress. At the macro level, the single word for horizontal progress is globalization--taking things that work somewhere and making them work everywhere. China is the paradigmatic example of globalization; its 20-year plan is to become like the United States is today. The Chinese have been straightforwardly copying everything that has worked in the developed world: 19th-century railroads, 20th-century air conditioning, and even entire cities. They might skip a few steps along the way--going straight to wireless without installing landlines, for instance--but they're copying all the same. The single word for vertical, 0 to 1 progress is technology. The rapid progress of information technology in recent decades has made Silicon Valley the capital of "technology" in general. But there is no reason why technology should be limited to computers. Properly understood, any new and better way of doing things is technology. Because globalization and technology are different modes of progress, it's possible to have both, either, or neither at the same time. For example, 1815 to 1914 was a period of both rapid technological development and rapid globalization. Between the First World War and Kissinger's trip to reopen relations with China in 1971, there was rapid technological development but not much globalization. Since 1971, we have seen rapid globalization along with limited technological development, mostly confined to IT. This age of globalization has made it easy to imagine that the decades ahead will bring more convergence and more sameness. Even our everyday language suggests we believe in a kind of technological end of history: the division of the world into the so-called developed and developing nations implies that the "developed" world has already achieved the achievable, and that poorer nations just need to catch up. But I don't think that's true. My own answer to the contrarian question is that most people think the future of the world will be defined by globalization, but the truth is that technology matters more. Without technological change, if China doubles its energy production over the next two decades, it will also double its air pollution. If every one of India's hundreds of millions of households were to live the way Americans already do--using only today's tools--the result would be environmentally catastrophic. Spreading old ways to create wealth around the world will result in devastation, not riches. In a world of scarce resources, globalization without new technology is unsustainable. New technology has never been an automatic feature of history. Our ancestors lived in static, zero-sum societies where success meant seizing things from others. They created new sources of wealth only rarely, and in the long run they could never create enough to save the average person from an extremely hard life. Then, after 10,000 years of fitful advance from primitive agriculture to medieval windmills and 16th-century astrolabes, the modern world suddenly experienced relentless technological progress from the advent of the steam engine in the 1760s all the way up to about 1970. As a result, we have inherited a richer society than any previous generation would have been able to imagine. Any generation excepting our parents' and grandparents', that is: in the late 1960s, they expected this progress to continue. They looked forward to a four-day workweek, energy too cheap to meter, and vacations on the moon. But it didn't happen. The smartphones that distract us from our surroundings also distract us from the fact that our surroundings are strangely old: only computers and communications have improved dramatically since midcentury. That doesn't mean our parents were wrong to imagine a better future--they were only wrong to expect it as something automatic. Today our challenge is to both imagine and create the new technologies that can make the 21st century more peaceful and prosperous than the 20th. New technology tends to come from new ventures--startups. From the Founding Fathers in politics to the Royal Society in science to Fairchild Semiconductor's "traitorous eight" in business, small groups of people bound together by a sense of mission have changed the world for the better. The easiest explanation for this is negative: it's hard to develop new things in big organizations, and it's even harder to do it by yourself. Bureaucratic hierarchies move slowly, and entrenched interests shy away from risk. In the most dysfunctional organizations, signaling that work is being done becomes a better strategy for career advancement than actually doing work (if this describes your company, you should quit now). At the other extreme, a lone genius might create a classic work of art or literature, but he could never invent an entire industry. Startups operate on the principle that you need to work with other people to get stuff done, but you also need to stay small enough so that you actually can. Positively defined, a startup is the largest group of people you can convince of a plan to build a different future. A new company's most important strength is new thinking: even more important than nimbleness, small size affords space to think. This book is about the questions you must ask and answer to succeed in the business of doing new things: what follows is not a manual or a record of knowledge but an exercise in thinking. Because that is what a startup has to do: question received ideas and rethink business from scratch. Num tempo em que a ideologia da moda é "lean startup", Peter Thiel vem mostrar exatamente o caminho oposto. Ele defende o fim da percepção de que o futuro é aleatório e a volta à ideologia que trouxe grande prosperidade nas últimas décadas. Leitura rápida e obrigatória para aqueles que desejam empreender. Em meio à tanto material de gestão na área de startups, Peter não se deixa influenciar e apresenta uma perspectiva completamente nova e engrandecedora. Recomendo fortemente. Being a successful business man in the area concerned in the book makes it very insightful for those who are willing to open their own company com short term. For those not qualified in this group, the book is still very good, although less impactant. 4,0 de 5 estrelasLivro muito interessante! Modo de pensamento do Thiel é muito diferente do senso comum que domina o mundo da startups. É um ótimo livro, que também deve ser lido com ressalvas e olhar crítico. It seems that Mr. Thiel has not only been an entrepreneur, but he's been a conscious one – reflecting and examining his steps as part of a larger "esprit du temps". Perder Thiel explica com exemplos fantásticos os erros e acertos de diversos empreendedores. É um livro obrigatório para qualquer uma que se envolva com alguma startup. Good book but not excellent. It tells you about how you need to create something new not copy others. It brings a good insight.